Well here we are, Tuesday. Melissa feels better. She is going to be reducing steroids again tonight and hopes that if she can wean quickly and not wheeze so much she's thinking that she'll be out Thursday. 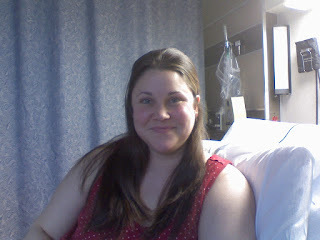 She's looking forward to Easter dinner- Prednisone makes you look forward dinner. And lunch. She says thank you for the flowers. Jenni - YOUR sister looks just like you. So glad that the news is looking better. It's all going to be good news from now on. Happy, happy days. Melissa - hope to meet you soon - if you are anything like your sister Jenni - then I love you already.